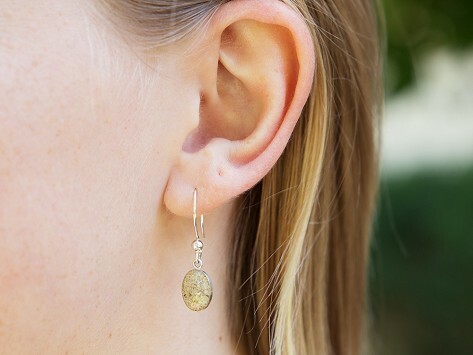 Capture and carry your favorite beach with these custom sand earrings. Grains are hand-sanded and trimmed with silver for a modern matte finish. Send them a capsule of your own sand or choose from their collection of over 1,500 beaches worldwide. I was looking for a nice pair of earrings for my wife for Xmas, and was surprised to find these unique earrings from Dune Jewelry. I'm a typical guy with absolutely no clue what makes for an attractive set of earrings, so I was excited to find something I thought she would like. Since we had recently taken a memorable trip to New Zealand, and visited Hot Water Beach, it seemed like the perfect gift to get for her. It brought a huge smile to her face! I gave the Dune Jewelry earrings to my wife for our anniversary. They brought a huge smile to her face!